By 1860 a new culture of people had firmly established themselves in the North West Territories. This culture was a mixture of Scottish, French and Native heritage and called themselves the "Metis". They incorporated a blend of both European and Native traditions into their lifestyle. For example, the set their village up in the French Seigneurial System, but still relied on the Buffalo Hunt to provide their daily sustainance. We also examined pictures from the textbook that displayed a Metis house and a community celebration that fit the time period of the era we are currently studying. We discussed house design, clothing , food, hair style and entertainment and compared the European aspects adopted by the Metis to the Native aspects. The video (below) is the first in a series of 7 videos that provide a great testimonial to the lifestyle and culture that the Metis people had established in the Red River area in the early to mid 1800's. I have just included the first video of the series. The Metis maintained many traditions from their Native ancestry. For instance, celebratory dances like "the jingle dance" (see picture) where the rhythm was created by the beating of Native drums created a fun, highly energetic production that often related to stories that were passed down through generations. 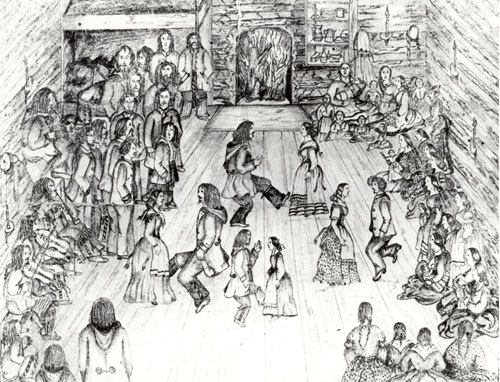 This was in contrast to the music influenced by European sounds of fiddles and flutes and the "jig" and "fling" dances more associated with Scotland and France. Today the students were given the opportunity to watch both the traditional Native Story Dances and European influenced dancing (jigs and flings). We discussed aspects of the rhythm, moves, dress and entertainment value of both types of dances, and how important these dances were to the Metis culture. We then had the students experience a form of these dances by teaching a lesson on "Square Dancing". To establish a better perspective of the day to day life of a Metis child growing up in the Red River area in the 1860's, we did selective readings from the novel "Angelique - Buffalo Hunt" by Cora Taylor. In these readings, we examined the role of the community in various aspects of the Metis culture. For example, how they established a leader for the annual Buffalo Hunt, the roles of men during the hunt, the jobs of the women and children in this major event within the community. The students learned of the pride and commitment of every member of the community in making this a success. We also touched on links to the Native cultural traditions such as using sap from pine trees for medicinal reasons. The Red River Settlement underwent rapid changes in the years immediately following Confederation. With the Canadian government's goal to establish a foothold in the regions west of Ontario before the Americans , John A. MacDonald hired surveyors to start plotting land for the expected newcomers. However, nobody told (or more importantly negotiated with) the Metis. The Metis, who had by now established a thriving community in the Red River area (present day Winnepeg) were blindsided by the arrival of these surveyors. This lead to a confrontation and essentially was the beginning of the Red River Rebellion. By the time the Red River Rebellion had been settled and Manitoba became the fifth province in the Confederation (July 15, 1870), the Canadian Government had already purchased the vast lands to the west from the Hudson Bay Company (June, 1870). The government, learning from the mistakes they made with the Metis, decided it was in their best interest to negotiate with the First Nation Peoples before simply claiming the North West land for their own. Several factors played into the governments hands that made the Native Canadian leaders more willing to sign the often unequal contracts. During the decade of the 1870's, seven treaties would be signed by Native Canadian tribes - that had occupied the territory for millenia - that essentially handed over the land to the Canadian Government to start advertising for new (mostly white) settlers to take over. In exchange for yielding their land (and nomadic, buffalo hunting lifestyle ) on the Prairies (current day Alberta and Saskatchewan), the Aboriginals received smaller tracts of reserve land (usually 600 metres squared/ family of five where they were supposed to be able to live undisturbed), cash, farm animals and tools (and so on) from the government. Not all Native leaders signed the treaties. The Plains Cree Chief, Big Bear, held off signing a treaty for many years. He felt the new settlers were getting a far better deal then the Natives, and wanted further pervisions to be included in the negotiations - including the idea of banding all the Native Reserves into one large tract of land (essentially creating a separate Native country within the country of Canada). When officials caught wind of his plan, they created new policies that disallowed the Natives from creating reserves that were within too close of a proximity to one another. Big Bear continued to try to negotiate peacefully for many years, but eventually lost the faith of his people and died a lonely man in 1882. A nice summary of his story is found in the clips below. Big Bear's entire story is captured in a full TV mini-series entitled "Big Bear - A Native American Movie" (1998). I intend to show the first hour of this movie to the students, as it provides an excellent recount of the dilemma the Natives faced when trying to negotiate the treaty agreements, the decline of the buffalo stocks and the deaths of large numbers of their tribes to starvation and disease. To watch the first 10 minutes see the clip below. You can watch the remainder of the series on Youtube. The map above outlines the land territory that was negotiated over in each of the treaties. During this decade, vast quantities of buffalo were exterminated almost to extinction. It became fashionable to buy buffalo robes and eat buffalo tongue in Europe, so Native hunters were encouraged to kill more animals in exchange for guns, horses and (the new evil introduced by European and American newcomers) alcohol. Non-Native "still" hunters often shot ranging buffalo for sport, simply leaving the carcasses to rot afterward. The loss of the great herds left many Plains people suffering from food shortages. The First Nation people had no experience with the dangers of alcohol and were often exploited by illegal America whiskey traders who had introduced it to them. 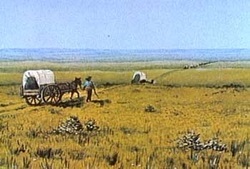 The whiskey traders supplied them a potent mixture of alcohol called "Whoop Up Juice" (see the video below about Fort Whoop Up near present day Lethbridge, Alberta). Alcohol abuse became rampant in many tribes. Many tribal leaders felt compelled to get assistance from Canadian politicians who promised them that they would dispel the illegal trading of alcohol. We watched the video Canada: A People's History "Taking the West" (see below from minute 5 to minute 13) and filled in an activity sheet based on what was said. Sensing that the land in the western part of Canada could rapidly depreciate into the completely unruly and disorganized settlement that was taking place in the America west, Prime Minister John A. MacDonald worked rapidly to establish a military force in the area that would help to take charge. Unlike the blue coated American calvary who often attempted to intimidate and bully the Native Peoples of the American Plains, the red coated NWMP were given a mandate to try and assist in the establishment of the Canadian west in a peaceful manner. The Canadian Plains Indians quickly came to respect the honest manner in which they were treated by the NWMP and for the most part they were accepted into the Native communities as friends. An interesting documentary made about the Mounties (The Days of Whiskey Gap - 1961) provides some eyewitness reports of people who lived in the prairies during the time the NWMP first arrived. The documentary is 28 minutes in length, but does a great job of comparing the recklessness of the American frontier to the relative tranquility of Canadian prairie settlement. The process of building the railway from eastern Ontario to British Columbia was an arduos and costly task. In fact, simply planning and surveying the course of the tracks took 10 years. The estimated cost of building such a long line was $100 000 000. In order to help fund the building of the railroad, John A. MacDonald hired a private group called the C anadian Pacific Railway (CPR) to be a partner. The CPR would pay for the railroad construction and then own the railroad. William Van Horne was hired to oversee the job. Over the next few lessons the students will spend time analyzing the tremendous accomplishment of building the railway across Canada. We will look at some of the hazards (swamps in Northern Ontario, massive forests in the interior of B.C. and of course tunneling through the Rocky Mountains), the controversies (the Pacific Scandal, Land Speculators, near bankruptsy and Chinese labourers) and the importance of having a railway line that streched from coast to coast (trade, tourism, mail delivery, military etc.). The following video has no sound effects. It simply shows pictures of prominent people and moments in the buildin g of the railway. It also supplies text to explain the pictures. The second video highlights Sir Sanford Fleming. A Canadian nineteenth-century engineer who planned three railways and played a pivotal role in the adoption of Standard Time. To finish the video component of these lessons I have included a tribute to the Chinese immigrant workers who contributed so much to the building of the railway in Canada, but receive so little of the credit. This website was created by the CBC to correspond with their videos entitled "Canada: A Nation's People." In preparation for the next few classes, the following website provides an excellent synopsis of the batttles of the Northhwest Rebellion. It inclues pictures of the battles, maps of the areas of the battles, the types of artillery used (including the famous Gatling Gun) and samples of Ragtime music which was the most popular type of music at the time. Oppurtunities for a lot of rich discussion here. Despite being vastly outnumbered (the NWMP numbered only 550 soldiers in the entire western section of Canada) at the onset of the Northwest Rebellion, the Canadian forces - aided by the addition of small units of cavalry and infantry after 1883 - were able to hold off a potentially formidable adversary in the Native Plains population (estimated to be at least 25 000 strong) and the Metis who had taken up residency in the Batoche area of Saskatchewan. The addition of the new troops, the vastly superior artillery at the disposal of the Canadian forces, starvation that was devasting the strengh and moral of the Native forces, and the completion of the CPR combined to end the Rebellion in 3 months. The National Film Board of Canada provides a short documentary/stage comedy (30 minutes) that I feel fits in well at this stage of our unit. It is my belief that the students now have adequate background knowledge to understand what the characters are talking about and it should help to solidify their comprehension of the material. audience of Indians and Métis, whose reactions are recorded." Villeneuve on You Tube (29 mins). Watch it here. By 1891, the conflicts in Western Canada experienced in the mid 1880's seemed to be a distant memory. The railroad was completed which increased tourism and trade between the provinces, most of the large Native Canadian populations had signed treaties with the government and most of the Metis had migrated into the U.S. or northern Canada. It was time for the Canadian government to focus on filling the West with "desirable" citizens. The following website entitled "Early Days: Homesteaders", is prehaps the best website I've found for grade eight students to get a general idea of everything from the types of animals raised on a homesteader farm, to the struggles of building a home, to community development, to hardships faced (storms, insects), to survival (and much more). The following clip provides a variety of pictures of different sod houses in the 1800's. The students usually enjoy watching this, because they can't fathom having this little space for a family of 6 (or more). When you mention that the families often brought the lifestock into the soddie during the winter months to share the space with the family, they nearly lose their minds. This short clip is one of the "A Part of Our Heritage" collection of Canadian historical vignettes. It is still played occasionally on the television. It shows a Hungarian immigrant family trying to create their homestead. The husband is ploughing the fields, while his pregnant wife is attempting to build the house out of bricks of sod. She eventually goes into labour, and with no hospital or medical officials available, the couple is forced to deliver on their own. A lot of discussion possibilities here. The following short movie (Wild Life) was created by Amanda Forbis and Wendy Tilby in 2011. It was nominated for an Oscar for Best Animated Short and it can be seen on the National Film Board of Canada website at the following weblink. It shows what life might have been like for immigrant groups like the Residents of Cannington Manor who came to Canada looking to upgrade their social status, but unprepared for the harsh realities of living in the Prairies. for the harsh conditions of the New World. A film about the beauty of the prairie, the pangs of homesickness and the folly of living dangerously out of context." The final grade eight history concept examines the ingenuity, determination and will power the prairie settlers possessed that enabled them to overcome the many hardships of homesteading, and not merely survive but thrive at the turn of the 20th century. This time period witnessed the growth (and/or establishment) of several of the major prairie urban centres that we are familiar with today (Calgary, Regina, Saskatoon, Medicine Hat etc.). It also saw the development of the cash crop Marquis wheat that is said to "have done as much as the railroad to open up the Canadian prairies for settlers eager to farm the land". This is a must watch as it lists (in a slide show with pictures and text) the many ways homesteaders solved problems such as how to treat infections with no hospitals or doctors available; how to build houses with no wood; how to survive extreme weather and insect infestations and much more. (Dan Chartrand). It reinforces the homesteader skills of "sharing resources" and "community cooperation." This activity is also an excellent way of demonstrating how much the capitalist mentality of the 21st century would suffer in trying to survive in the West in the late 19th century. 1. There were three basic things a homesteader required to survive the first harsh year on the Prairies (food, clothing and shelter). To represent these objects, prior to the start of class, create a small house made of grey (to represent the colour of sod) constuction paper. Use a marker to sketch a rudimentary door and a couple of windows. Create a small potatoe out of brown construction paper to represent the necessity of food for the homesteader. Create a tiny shirt made of green construction paper and use red construction paper to cut out four tiny circles to represent buttons to glue on the front of the shirt. 2. Gather the following equipment (a few pieces of green, grey, brown and red construction paper, a couple of pencils, a couple of black markers, a couple pairs of scissors, two glue sticks and a couple of rulers). The construction paper represents the raw, natural resources available to the settlers on their land such as wood (rare), wheat and wildlife [as a source of food (meat) and clothing (fur and skins)]. The scissors, pencils, markers and gluesticks represent the equipment such as ploughs, horses and tools that the settlers would need to extract and produce the basic necessities of life. Note: the quantity of the equipment will vary with the class size. 3. Display the three basic objects (food, shelter and clothing) on the front board for the students. Split the class up into several small groups (approximately 5-6 students max). Tell them that each group represents an immigrant family that has just arrived in the Canadian West in April in the year of 1898 (make it up). Indicate that they will be doing an activity in which they must recreate the objects on the front board using the equipment and resources you supply for them. Stress that each family must produce one of each of the three basic objects (exactly as they are displayed on the front board) for each family member in the time alloted or some (or all) of the family members will perish. Hint: I give the students only about 15 minutes to accomplish the task. To represent the anxiety that was felt by the homesteaders trying to accomplish all of this before winter set in (approximately November) I provide only two-three minutes per month and keep indicating the change in calender by writing it on the board and stating it out loud to the students. 4. To represent the diversity (and the crapshoot) of land selection and the lack of availabile resources in the Prairies for the new homesteader, pass out the equipment, but be sure to not give the equipment out equally. For example, give one group a piece of brown constuction paper, a piece of red construction paper and a pair of scissors. Give another group a piece of green construction paper, a black marker and a pencil. The third group gets only a glue stick and grey construction paper etc. The students are likely to be confused by this and question how they are going to create the objects on the board without having all of the resources they need to accomplish the task. This is what you want! 5. On your command, the activity begins. For the first few minutes be prepared for the various groups to sit puzzled and complain that this is impossible. As time continues to tick away, and you continue to announce the start of a new month, there is likely to be a couple of students who will try to steal resources from other groups, others will create the objects using the wrong colours, others will simply rip the paper instead of drawing the sketch first and then using the scissors, and others will simply quit and refuse to continue. If this happens, the lesson is an unmitigated success! The students have acted just like a modern, capitalist is supposed to act. "Take care of yourself first. Only the strong survive." Et cetera. Et cetera. 6. Once the time is up, have each group display what they were able to accomplish. You should find that most of the groups will have perished as they will not have produced exact duplicates of the objects on the front board. Discuss the hardships that they faced during the activity and ways they could have conducted the assignment differently to make sure all of the groups survived. Hopefully they will realize that they need to share their resources and assist each other in order to accomplish the task. 7. Pass out the same materials to the same groups again. Set the timer and begin the activity again. You should find that all of the groups survive, because they work cooperatively and share the resources. The following video talks about the develop of Marquis Wheat and it's impact on farming in the West. When we initially started our study of Canadian history in September, the country of Canada had yet to even form a Confederation. Instead, British North America was a group of independent colonies of England who shared little in common and thus had little to do with one another. As we end our study of grade eight history in 1913, we have witnessed the development of Canada into the second largest country (by land mass) in the world. No small accomplishment for a society that was loosely tied together by a transcontinental railroad that nearly saw the country go bankrupt in it's infancy. The country was still primarily regionalized, and the province of Newfoundland was still yet to become part of our nation (choosing instead to remain a colony of England). Despite Canada's immigration boom at the turn of the 20th century, many people were still skeptical if this fledgling country would survive. Yet the dream proclaimed by John A. MacDonald that Canada would eventually become a world leader would really start to take shape in the next few decades. In grade ten, you will pick up the story examining the events between 1914 and 1918. This era would see the world plunge into a conflict involving many of the world's strongest nations (WWI) and artillery never used before in combat. To many historians, this was the time period that would see Canada mature quickly, regions bound together and the nation become one of the most respected in the world.